Makeup and beauty !!! : MAC GOOD LUCK TROLLS BEAUTY POWDER "PLAY IT PROPER"
MAC GOOD LUCK TROLLS BEAUTY POWDER "PLAY IT PROPER"
"When you are a makeup lover and started blogging as your passion and slowly it grows along with your responsibilities towards your family, then there are few things that you either let it go or keep it forever in the hope that one day you will show/share it with the world..."
Another reason for sharing this blog post where it is a limited edition product is just because if you like my review then you can definitely shop it from Mac cosmetics.com that too in discount (yes, it is now $11.20 instead of $28) and use SOFU (ship out from the USA) to get it deliver to your door. A silky-soft "beauty" powder that's delicately tinted and luxuriously pearl. Goes on as an ultra-fine, shimmering "veil" to the skin. Can be applied as a highlight, soft blush or overall finish. Specially packaged in crazy hues featuring the trolls' logo in black. Adds a sheer veil of color or highlight. Although Mac flamingo park collection was a colorful collection of the products but MAC GOOD LUCK TROLLS BEAUTY POWDER "PLAY IT PROPER" has a very colorful packaging indeed. The self-design of good trolls doll on beauty powder just added a one brownie point of reason to grab this powder. The beauty powder weight 10gm which will last forever I guess. And it comes up with a small mirror inside the case but without a brush. MAC GOOD LUCK TROLLS BEAUTY POWDER "PLAY IT PROPER" is described as "pastel soft pink with sparkles". The sparkle in the beauty powder are quite subtle kind off and once you blend it properly into your skin it hardly showed up. 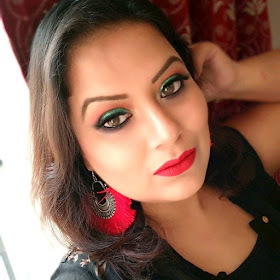 As it is a pastel pink beauty powder (I already mention earlier) for which it will suit only fair skin people and that's why through an Indian blogger"s eye I can say it is definitely not made for Indian skin tone. Again, as I am a fair (I wish I am bit tan as I love all those warm undertones a lot) this powder goes quite well on my skin. I must admit that I bought this powder shredding 28$ plus shipping to India just in temptation after seeing the packaging only. As it was my first beauty powder from Mac cosmetics, I was little confused as for how to use it properly. Moreover, the shade is so light pink that I can use it only as either highlighter or blush. But finally, after using this beauty powder in every single possible way, I found that I personally prefer to use this beauty powder as blush during summer while in winter as I became little more ghostly fair I just love to apply it lightly all over my highlighted area of the face just to give a subtle strobing effect. The powder stays pretty 6 hours on my skin during winter but as it is a very light pink shade so it fades out a bit after 4 and half hours in hot and sweaty summers (you know how Indian summers are). Overall I have a mixed kind of love and hates feeling about this powder. I love the way it adds a subtle glow on my skin but hate it as it is very light pastel pink which will hardly show up on my skin if I get tanned in summer. So, yeah that concludes my post that was long pending in my draft folder of the blog and finally I decide to post it. Until next time "Stay beautiful with your makeup on..."